Leftover Pieces / Leftover Press is a very interesting small press run by Billy Bridwell III out of Arizona. 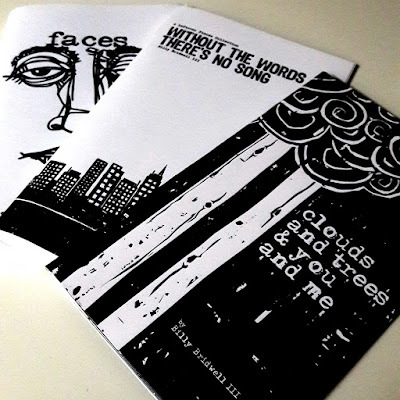 The three publications pictured above, 'Without The Words There's No Song', 'Faces', and 'Clouds and Trees & You and Me' are the press' first three publications, all authored by Billy himself. 'Without Words There's No Song' is the most comprehensive, and certainly the most personal of the three publications. A documentation of Billy's time playing in punk and rock bands throughout the 90s and 00s, and a collection of lyrics that he wrote during that time; "To me, the words always meant more than the music ever could. This is an attempt to put it in one place, taken from the context of song." The lyrics, which are "part song, part prose, part story", make for a very interesting and revealing read. A journey through Billy's eyes and a celebration of "twenty-plus years of loneliness and angst, panic and worry, excitement and unity, to true love and hope". 'Faces' is a collection of digitally illustrated... faces. Fifty two different faces to be exact. Drawn using a combination of Autodesk Sketchbook Pro, Inkscape and Indesign, and each accompanied by a (seemingly) random motivational phrase, which Billy says are "simply a reminder to always stay true to yourself. Be aware of your surroundings and how you fit into them. This world can eat you alive, give yourself a fighting chance". I really enjoyed this zine and was very impressed with the illustrations, and diversity and the detail captured in each drawing. 'Clouds and Trees & You and Me' features a beautiful long form poem about the nature of life, and similar to 'Faces', encourages us to be true to ourselves no matter what. The poem is also beautifully illustrated, each page featuring yet more remarkable digital illustration, closely mimicking woodcut art. This was a quick read, a but a lovely little zine and highly recommended. Leftover Press have recently released a fourth publication of Billy's short stories, which I am yet to get my hands on, but hope to soon. Please support this fantastic press by purchasing some of these zines for yourself by clicking the image below.